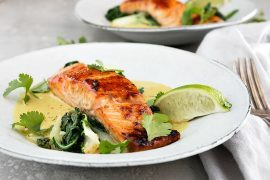 I continue to really love salmon in the Instant Pot, so I thought I’d share another quick and easy Instant Pot salmon recipe for you. 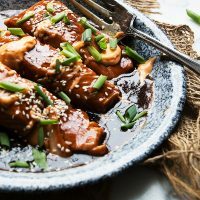 This Teriyaki Salmon has long been one of my oven favourites, so I’ve adapted it for the Instant Pot as well. It’s super quick and easy and makes for a perfect weeknight dinner. And if your home is anything like mine, salmon is in regular rotation, so it’s always great to have a variety of ways to enjoy it. As I mentioned before, the Instant Pot does wonderful things to salmon, with no need to turn on the oven. Serve this one with some rice and/or a veg for a great meal! I find that my salmon is done when the lid comes off the Instant Pot after the short pressure cooking and the 5 minute natural pressure release. If yours isn’t, leave the salmon in the pot with the sauce while you switch to the Saute step and it will finish cooking as the sauce heats. Remove salmon to a plate once cooked and before thickening the sauce. If you are doing the oven method, note that the ingredient amounts are slightly different, so refer to the Recipe Notes, which will list amounts for those ingredients that are different. Looking for Instant Pot Salmon Recipes? You might also like my Vietnamese-Inspired Instant Pot Salmon! 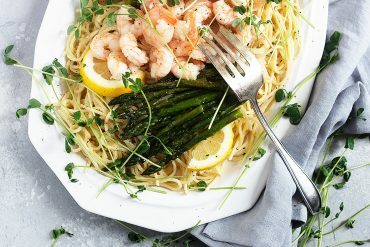 Quick, easy and delicious Instant Pot recipe. Also includes an almost as quick oven method (see Recipe Notes). Serve with rice and a vegetable for a great dinner! Make the Sriracha Mayo by combining the mayo and sriracha in a small bowl. Stir until combined. Set aside. Set Instant Pot to Saute with the Normal heat setting. Add the soy sauce, brown sugar, ginger, garlic, honey and water to the pot and bring to a boil. Reduce Saute heat setting to low and allow to simmer for 2-3 minutes. Turn off Instant Pot. Place salmon fillets into the Instant Pot with the sauce, skin/flat side up. Place lid on Instant Pot and set the vent to sealing. Select Pressure Cooking on the Instant Pot and switch to LOW PRESSURE with the time set to 1 minute. Allow to pressure cook, then allow for a 5 minute natural pressure release. Release the remaining pressure on the Instant Pot and remove the lid. Check the salmon. It should be cooked through at this point, but if not, allow to cook in the warm sauce for a minute or so to complete cooking. Set Instant Pot to Saute with the Normal heat setting. In a small bowl, combine the cornstarch and water and stir until completely smooth. Add to the sauce a bit at a time and cook, stirring, until mixture thickens to desired level. 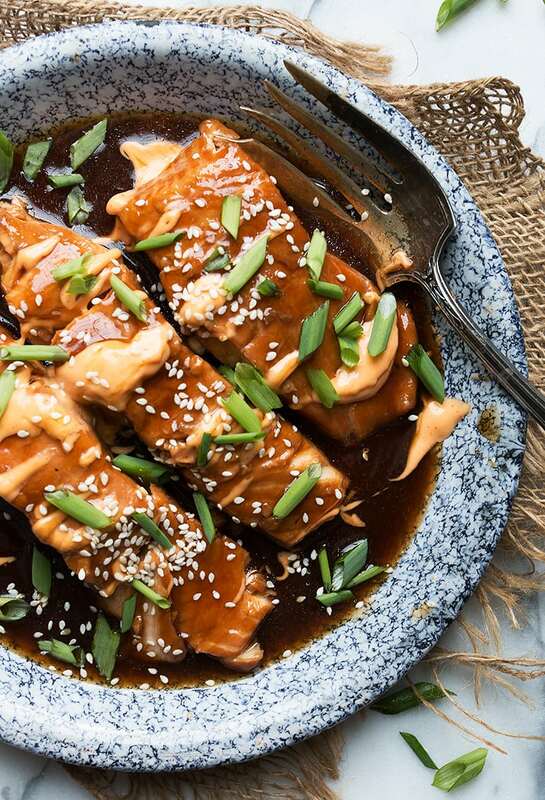 Pour sauce over salmon and garnish with sesame seeds, chopped green onion and a drizzle of the Sriracha Mayo. In a small saucepan over medium heat, add the soy sauce, brown sugar, honey, ginger, garlic, honey and 1 cup of water. Bring to a simmer. In a small bowl, stir together 1 Tbsp cornstarch with 1/4 cup water. Stir the cornstarch mixture into the sauce and cook until thickened, about 2 minutes. Lightly grease a baking pan and place your salmon fillets into the pan. Brush with some of the sauce and bake in preheated oven for 15-20 minutes, basting with sauce once or twice, until cooked through. 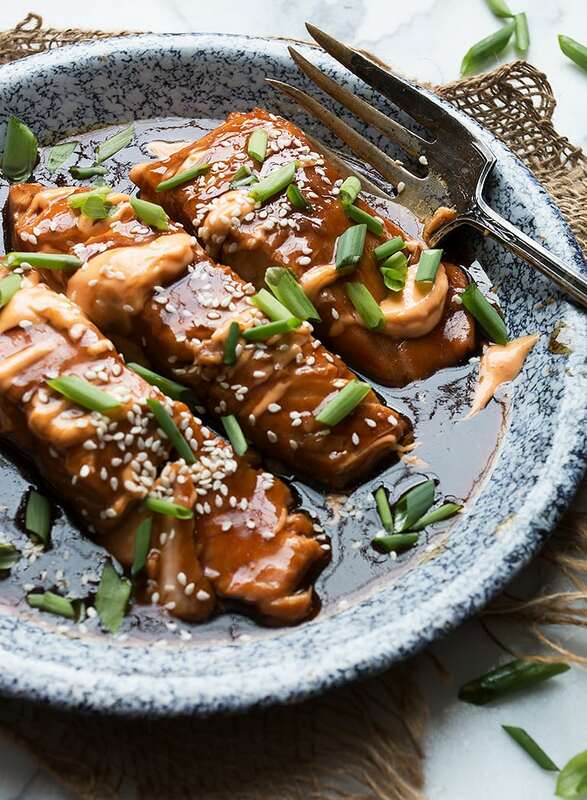 Serve with additional sauce and garnished with sesame seeds, green onion and sriracha mayo. Looks awesome. 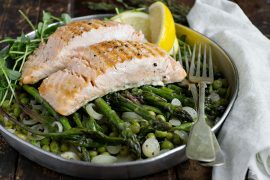 Can I place the salmon fillets on top of a steam rack in the Instant Pot, or is it important for the fish to cook right in the sauce? I’ve never tried that Jasmine, but I don’t see any reason why it wouldn’t work just fine. I have one child that is not a fish lover, could I do 2 chicken breast in the Teriyaki sauce first, then use the same sauce to do the Salmon in before I thicken it? Hi Jackie and yes, I think that would work just fine :) Enjoy! So glad you enjoyed it Jo-Ann :) Thanks! I am assuming the half cup of water is added in Step 2. I haven’t yet tried salmon in my Instant Pot but this looks like the perfect recipe to give it a try. What about frozen salmon? (I use a package from Costco) i believe I usually do 6min high pressure with just salmon and a bit of liquid. Hi Dara, You can start with frozen. Just thaw it and then follow the recipe. Being from the Maritimes & having access to fresh Atlantic salmon, we’re used to pan sautéed salmon. 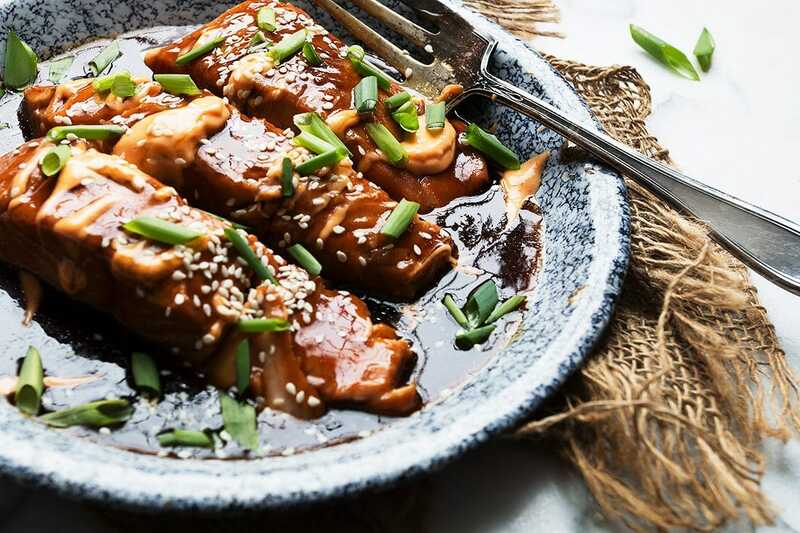 Couldn’t resist trying your Instant Pot salmon as we both enjoy a teriyaki sauce. It didn’t disappoint! Picked up some salmon fillets that were on sale so we cut larger portions for the next round. The single serving store portions are too small! The IP did a good job on the salmon. That was supposed to be 5 star! Couldn’t change it! With sriracha mayo? Forget about it! You had me at hello! So, I’ve had my insta-pot for almost 2 years and sadly, I have yet to use it. I know, I know! Clearly I need to get on using it and make this salmon, because OMG, does this look AMAZING!!! Loving the teriyaki with the spicy sriracha mayo! SO much flavor! Pinning to try! Cheers! This is the best looking salmon I ever did see, Jennifer. I think I dreamed of this last night after I saw it on IG! Can’t wait to try! LOVE sriracha…and salmon! It does! Sorry about that. Fixed now :) Thanks! I haven’t pulled the trigger on the Instant Pot yet Jennifer, so thanks for the oven directions. This looks so tasty! Love that sriracha mayo! Thanks Mary Ann and yes, this one is just as quick in the oven, so enjoy! 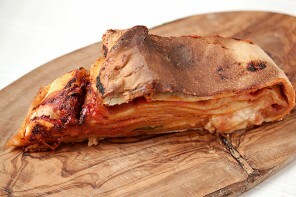 Delicious flavors in this recipe! You make everything sounds so easy – this is perfect for a weeknight dinner. This will be my first foray into cooking fish in my IP, can’t wait ~ one minute!! I bet the texture is amazing. Thanks Sue and yes, I do love the salmon in the Instant Pot! This salmon looks like the perfect recipe to me. I have to unpack my new Instant Pot and give this recipe a try. It sounds incredibly easy and looks divine!